In the sea, so much happens at once. Other bathers poke and pull at you and paddle away, laughing. Teenagers on water-scooters speed past, pushing miniature waves your way, and their roar is frightening underwater; there’s no way to triangulate, no way to tell the distance or location of the craft. To make the decision to listen to the broadcast meant a commitment of sorts – viewers had to dress for the occasion and bring required accessories. 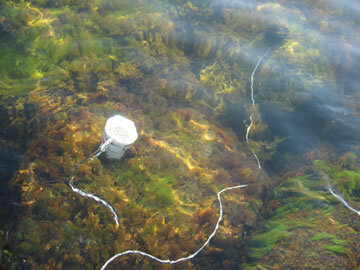 We set up our equipment on a rocky section of the harbour, in an area not meant for use by bathers. It was the only way we could imagine to protect the electronic equipment and the bathers. We created a small island for ourselves, away from the roar of the crowd. We didn’t mean to do it, but that’s what we did. Getting to us, to the water, required a descent down a steep retaining wall of boulders. Our sounds broadcast beyond our island and isolated swimmers paddled over from the wooden piers. They were curious, but nothing more. If you concentrated on it, you could be comfortable in the water. If you relaxed, tried to let your muscles go, you could stay warm. Bathers could hear the sounds clearly through bone conduction so long as their heads were at least partially submerged. 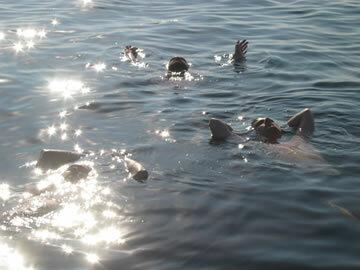 Listeners experimented by sitting on rocks near the shore and dipping their heads underwater, by plunging underwater with snorkels, and by treading water far from shore. Most found very quickly that the only sustainable way to listen was to lie flat on their backs, floating, with their hands above their heads for balance. This way one got one’s head underwater, stayed as much as possible in the warm upper layer of the water, and got the sun’s warmth. Once you got the floating right you could nearly let go and simply listen – nearly. Each passing boat required some adjustment. The artists who made works for the event took as their various points of departure the physical qualities of water, collective memories of the sea and its creatures, and the current political situation in the Öresund region. The audio broadcast underwater mingled with the splashing of nearby swimmers and the roaring tones of near and far watercraft. Most of the audience had never listened to anything through underwater speakers before. Their sense of balance was altered or lost altogether. Attempts to pull oneself out of the water were awkward, ridiculous. The reason that your voice sounds so different on a recording than it does inside your head (so embarrassing!) is that when you hear your own voice you hear both with your eardrums and through the bones in your skull. When you listen to the voice on the recording, you hear only with your eardrums and the voice sounds hollower, shockingly different. If you listened to that recording with both a regular set of headphones and a scuba diver’s bite speaker, it would sound normal. You would have your voice back. When we arrived at Västra Hamnen it was packed with tanned young bodies. Part of Västra Hamnen was developed as a swimming and sunbathing site by the city of Malmö in conjunction with an experimental housing development built as part of an exhibition in 2001 at the harbor. The homes in Västra Hamnen are some of the more costly places to live in Malmö. The people who live in them do not universally care for the crowds that have grown, year after year, at the concrete and wooden piers that constitute the public bathing site. The crowds are noisy and young. Young men on EU-mopeds modified for both velocity and auditory qualities speed about. Fights occasionally break out. Eventually the city installed speed bumps and other traffic calming measures, started to develop other areas of the harbor in an effort to lure the public away from the housing developments. The concrete bathing site, however desperate and grey when empty, remains popular. The majority have not been moved, either to the beach on one side or to the park on the other. Young men with giant diamond studs in their ears sit with boom boxes and wait for something nice in a bikini top. Groups of women tan together, turning over simultaneously. Everywhere you can hear chatter, laughing young women, and the sound of dozens of stereos, each playing something aggressive and American. I attempted to force “viewers” of audio artworks to abandon their normal gesture sequences. I wanted to find a way to engage viewers in the act of listening, to suggest that they make decisions about how and why they should listen. The viewers that came to the harbor especially for the event, sound-art consumers lured by posters, flyers, and art-world word-of-mouth, mingled with hundreds of bathers at the public sunbathing and swimming site in Västra Hamnen. The sounds were broadcast underwater using the Swedish national synchronized swimming team's equipment. 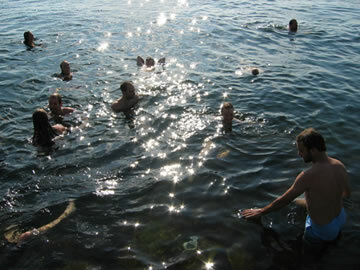 The event took place during the hottest days of the Swedish summer, on August 6 and 8, 2004. Abinadi Meza, Ann Rosén, Enrico Glerean, Johan Sandsjö, Jon Eriksen, mAggIE mAYhEm, Mathias Kristersson and Trygve Luktvasslimo, Petri Kuljuntausta, Plakto Needs Lint, Rich Barlow, and Sten-Olof Hellström contributed works to the broadcast. The underwater broadcast was part of the cultural organization Laika’s project “karta/terräng” and was produced by Mathias Holmberg. Alison Gerber is an artist based in Malmö, Sweden. Her work can be viewed at hostelprojects.org/alison/.